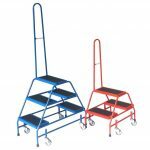 Stepover Warehouse Steps Archives - Shelving & Racking Ltd.
A lightweight step for use in the office/storeroom. Fitted with spring loaded self weight retractable castors, step onto the step and all four rubber feet impact with the floor to immobilise the step and give maximum stability. With anti-slip PVC treads for maximum grip, and optional side handle to give support when required. The two tread option is 380mm wide and the three tread option 445mm wide.